A visit to New York before Wilder's fight with Luis Ortiz on Nov. 4 includes a photo session, some brash talk and a good bit of fun. 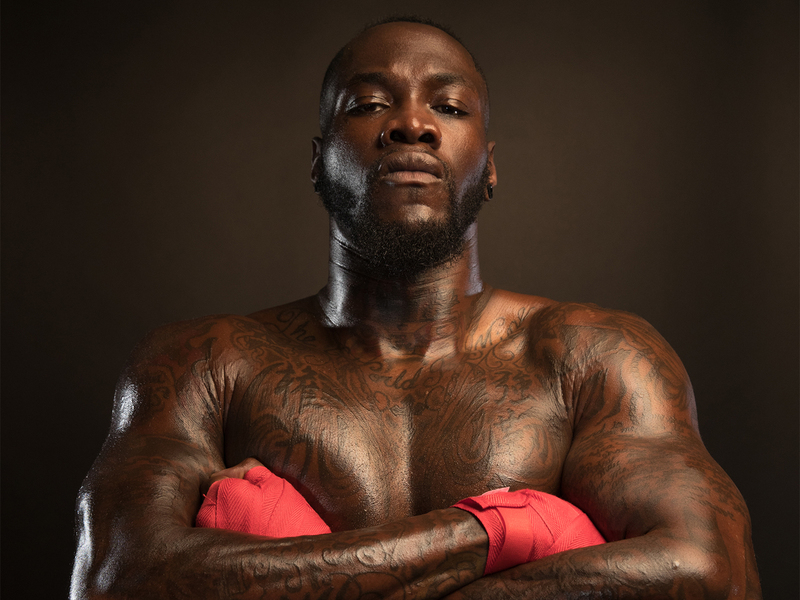 NEW YORK — Standing in a hollowed-out ballroom at the Dream Hotel in New York City, Deontay Wilder signed a dozen or so boxing gloves for a Showtime Sports marketing crew he would soon pose for minutes later. Cordial and polite, Wilder made small talk with the photographers. Hours earlier, he stood before a multitude of media to announce his Nov. 4 heavyweight title bout with Luis Ortiz. Wearing a conspicuous black and gold robe and Gucci sunglasses, Wilder was anything but cordial and polite on the press conference stage. Wilder paused and pounded his chest four times. On the first Saturday in November at the Barclay’s Center in Brooklyn, Cuba’s Luis Ortiz (27-0, 23 KO’s) will try to do just that. Wilder (38-0, 37 KO’s) is a menace in the division and currently holds the WBC heavyweight title. Most fighters are frightened by both, but neither Wilder nor Ortiz is fearful of the other. On stage with the world watching, Wilder lives up to his intimidating reputation. He’s boisterous, he’s aggressive, and he doesn’t hesitate to terrorize his opponents. But behind closed doors, he transforms into a contrasting character. Back in the ballroom after the presser, Wilder still hovered over the table littered with boxing gloves with his name on them. Scattered around were accessories for his impending photoshoot. A photographer asked Wilder if he’s fine with wearing red tape on his hands for the shots. “How about we get some food? That’d be even better,” Wilder responded, sarcastically. The room filled with laughter. But those close to Wilder knew he was being serious. Standing 6'7" and weighing 227 pounds, the fighter needed fuel. His team was way ahead of him. “Allegedly there’s a pizza on the way,” Timothy Smith of Haymon Boxing answered. “Oh man, this is going to be a good day,” Wilder said. Jay Deas, Wilder’s coach and co-manager, coordinated the delivery. Matthew Donovan handled just about everything else. It had already been a long day—from the press conference to post-conference interviews with both video and print reporters to photos and conversations with loose acquaintances and more. That all spanned a good three hours. The shoot was slotted for an hour or so more. Lastly, Wilder had a trip to Complex magazine on his agenda. Donovan remained in charge of making sure Wilder more or less stuck to the itinerary. “I’m on Deontay duty today,” Donovan said. “But it’s been fun.” Deas concurred, saying media-driven days are productive for Wilder. The hungry Wilder wasn’t thinking about the payoff just yet. Satisfied with the anticipated arrival of sustenance, Wilder obliged to the crew’s further requests and drifted off into a changing room. He emerged from behind the set with an entire box of pizza. He wore flashy boxing shorts with his name across the waist and a loose fitting tank top to match. He carried the pizza to a table in the corner of the room and sat down by himself to dig in. “Anybody want some of this?” he asked. Everyone else grazed on a second box, so Wilder happily feasted on what had become his own. After downing a few slices and killing a can of soda, he removed the tank top and strided over to the photographers. “You let yourself go, man,” Smith replied, jokingly. “I need some more definition,” Wilder said. He didn’t drop down and rep out 20; his grumbles were just a hoax. After all, despite mean-mugging at photoshoots and relentlessly throwing haymakers in the ring, Wilder is actually a humorous person. On the way down to the photoshoot, he cracked jokes in a crowded elevator. Throughout the day, he randomly shouted “Bombsquadddddd!” (which is what he and his team have nicknamed themselves) when everyone least expected it. Startling at first, his antics were generally followed by a shared chuckle among those near—after their ears stopped ringing. Sometimes Wilder’s comedy seeps into his pre-fight rhetoric. Luis Ortiz, 38, holds the nickname “King Kong.” He stands 6’4” and weighs upward of 240 pounds, resembling the human-form of the fictional gorilla. At the press conference, Wilder quickly reminded everyone of Kong’s fate in the fabled story. (Kong fell to his death from the top of the Empire State Building, for those unaware). “We’re in New York, too,” Wilder said. “And you already know what happened to King Kong in New York.” Mass hysteria in the room immediately followed. Earlier in the press conference, fight promoter Lou DiBella called Ortiz the “boogeyman” of the division because he scares away anybody who dares to think about fighting him. Wilder used his wit to poke fun at that reference, too. “If he’s the boogeyman, then I can’t wait to shine a light on him. Because the boogeyman is only effective at night,” Wilder said. More snickering, and a slight grin of gratification from Wilder. All jokes aside, Nov. 4’s showdown pits two mammoths of the division head-to-head. Wilder and Ortiz have combined for 60 knockouts in their 65 combined professional bouts. Odds are this fight won’t go the distance, either. Smith, the vice president of communications at Haymon Sports, said that there’s nothing like a heavyweight title fight. As a former sports reporter for both the New York Times and the New York Daily News, he’s covered the World Series, the Olympics and other large sporting spectacles. But he said the suspense and energy involved in a heavyweight title fixture exceeds them all. One punch can alter everything. It’ll be the same way on Nov. 4 in Brooklyn. Wilder agreed with Smith’s first take but not with the latter. “There’s only one brutal puncher, to be real,” Wilder said. “I’m the only knockout artist. He’s O.K.” Even that elicited laughter amongst the media. There are only a few subjects that Wilder takes to with undivided seriousness. His kids, for one. Wilder dropped out of Shelton State Community College at age 19 to care for his first-born daughter, Naieya. She was born with a rare spinal cord defect called spina bifida. As doctors alarmed him of her worsening condition, Wilder worked as a delivery truck driver for a beer company and in the kitchen at Red Lobster to afford the medical bills. With his athleticism and drive to aid Naieya, he turned to boxing for much-needed paychecks. His decision has panned out with 38 and counting professional victories. Naieya is now 12 years-old and living with the best care. With his daughter happy and healthy, Wilder has honed in on his career. In addition to family, unifying the heavyweight division is a topic Wilder doesn’t laugh off. Lou DiBella made it clear at the press conference that Wilder didn’t have to fight Ortiz. He paid a “large sum” of money to mandatory challenger Bermane Stiverne to brush him aside and set up the matchup with Ortiz. Nobody wants to see Wilder wallop a less-qualified boxer like Stiverne again, and Wilder knows that. He made a mockery of Stiverne in a unanimous decision in January 2015. Everybody wants to watch Wilder and Anthony Joshua (19-0, 19 KO’s). Joshua holds the IBO, WBA and IBF heavyweight titles. Wilder said when—not if—he knocks out Ortiz in the “first three rounds,” then the date with Joshua will be all but set. He’ll have his shot at unification at last. Before then, sending Ortiz to the mat will be a tall task. But if anyone can do it, it’s Wilder. There will be likely be many slices of pizza, probably just as many jokes and plenty of training with Deas between now and then. But when Wilder has a vision, the public wisecracks cease and exertion ensues. He stops at nothing to work the notion into reality. Nov. 4’s fight against Ortiz is just the 39th checkpoint in achieving a goal he’s visualized and meditated on for quite some time: unification.